Let you guide without efforts thanks to our electrical bikes through the best districts of Nice & all the hills around to see in 2h30 the monuments, squares, new gardens & streets of the Old Town, the gardens, waterfall & ruins of the Castle Hill, the roman ruins, the monastery of Cimiez & his beautifull gardens. You will know the whole Nice in 2h30, places you need 2 or 3 days to see walking, with amazing panoramic views on the Angel's Bay and the City. Other surprise places will be seen that we prefer maintain secrets. Coming down hill from the best hills, we will pass through a lot of different popular districts, unusual for tourists but which really worth it, included the renew district of Libération and it's popular market (morning). Bike & platter of Local Food Specialities included. 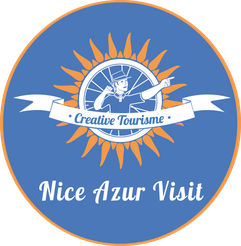 We will discover the markets of Old Nice & arounds and visit the best colourfull historic shops of Nice, to taste all the best meals, products & sweet pastry. Ideal for food lovers & to discover the local culture. Don't eat before the tour ! A unique and surprising tour to know all about Monaco, not only the internationally famous highlights (Casino of Monte-Carlo, Grimaldi Prince Palace) but the unknown gems of the Principalty where the secrets lie hidden from mass tourism ways. A different way to understand Monaco looking the amazing evolution of this mini-state of 2.5 km², which change her façade every time from the 1920 until today, and is still transforming very fast with pharaonic projects. With old postal cards we will help you to understand the urban transformation. A fresh ballad in the honeycomb streets of the Oldest district of Nice guided by a specialist, young, passionate & local guide. We will tell you the whole History of Nice immerged inside this incredible labyrinth of streets with a mix of Italian & French Provence style, his markets, monuments, churches, squares, misteries & secrets. A perfect way to start holidays in Nice giving you also the best informations about bars, snacks, shops & restaurants where you can avoid tourists traps. We will finish with the visit of the Castle Hill, his gardens, waterfall, panoramic views & ruins to explore the oldest reminds of the Greek foundation in the peacefull gardens. An amazing bike tour to visit one of the most beautifull part of the French Riviera, the colourfull & charming medieval Old Town of Villefranche/mer (walking visit) & his majestuous XVIth century fortress build over the sea. A surprising evasion full of colours over the transparent azure of the sea, the green forest of the capes, the red, orange, yellow houses of the Old Town & the cold grey of the medieval stones. This fantastic bay full of character was a special natural harbour for the Turkish, Russian & American Navy, and became during the Belle Epoque until now the elected place for the richest fortune in the world, as the amazing villas testify. Opportunity to continue the tour to the Cape Ferrat (Billionaires'Cape). Optional non included : guided tour of the Villa Rothschild, Villa Kerylos and Villa Santo Sospir and / or stop relaxing / swimming on a paradisiacal beach.